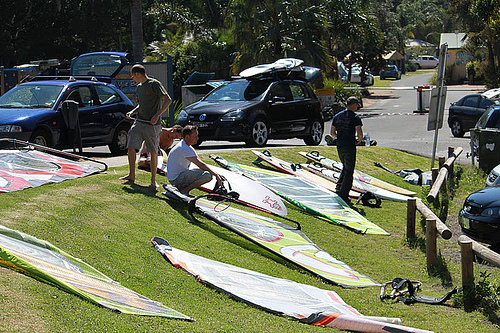 Last weekend was the Event 2 of 5 for the NSW state championship. Once again it took place at Gerroa, 7 Mile beach. With an exceptional forecast of long period southerly swell and 25kt sea breezes for the Saturday everything was looking promising for a great day’s competition. Our event sponsor WindSurfnSnow was represented by Anne who brought some awesome Fanatic, Neil Pryde and North demo gear as well as prizes. The 81 litre Fanatic quad was very popular and the 4 battened 5.0 Hero looked the business rigged up ready to go. So a big thanks to Sam Parker from WSnS and his team for the support they kindly provided. Once again Gerroa delivered high performance conditions with 6 to 7 foot high waves on the Saturday with 20-25 knots nor’easter wind allowing the 48 entrants to compete in great conditions. It was one of the biggest turn outs for NSWWA in years so thanks to everybody to put on such a great show, with a special thanks for people coming all the way from Queensland and Victoria to compete. The Pros division was sent out first to compete and from the first heat in the first round you could really see that the level on the water for this comp was just fantastic. The conditions certainly allowed the top Pros to really standout. Deep, laydown bottom turns, huge sprays gouging out the lip, Goiters (landed dry), end-over-end forwards, a 360, back loops and even a Shaka landed planning on the inside just for fun. Tim Knowles took the top honours with one of the biggest aerials of the day, getting lifted 15ft by the cross-offshore gusts. Other standouts were Barny who probably dominated the air and Logan who just seemed everywhere, particular if there was a nice 6ft set to project off not forgetting Dan and his deep knowledge of the spot. The Amateurs were sent out next. Some of them had nothing but envy for the Pros and all attempted to make the best of the clean sets with long wave rides on offer. Many played a slightly more conservative contest strategy aiming to fill their score card with the required 3 waves and 1 jump and emerging with all their gear intact. Adam was clearly the standout sailor, looking comfortable in the conditions by picking off the bigger sets. The Masters division was just going off as you could see that experience and knowledge of the spot these guys have. 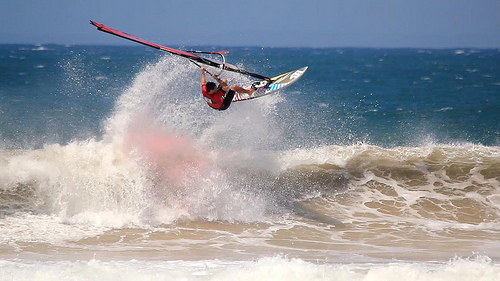 This made for a really radical style of windsurfing. This is usually the most contested division, especially with Warren Holder back on the water after injury. Mike Preswick was stoked on making the final but it was Alan Bailey who took the win before he had to organise the BBQ. Owing to the conditions the Juniors’ division was held over in the hope of slightly more user-friendly conditions. This did not stop young Jake and Jessica from freesailing up the beach. For the rest, multiple sets and regular holes in the wind left many competitors floundering in the impact zone at times. The banks and tide meant that a significant current was dragging sailors into the worst of it. There were 6ft heavy closeouts where the waves just crashed onto the shallow bank a fraction earlier than expected. This created one of two things; a great ramp for ‘hero’ aerials or a smack to the head and over-the falls ‘tragedy’. So the conditions were meant that any mistake was usually quite consequential but so rewarding. 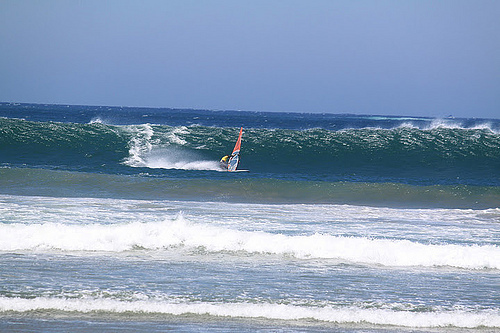 The waves more power than expected and speed was a key to making through the sections. There was a considerable amount of broken gear by the end of the day. Rough estimates put this at 6 broken masts and 4 torn sails. Ben Kirk was the most unlucky of all going through his complete set of masts during the day. Mark Town in his Amateur heat took one of the bigger hits of the day, virtually standing still as a ¾ mast high wave threw its lip on top of him. Unfortunately there were a couple of injuries with Barney over-rotating on a forward and badly hurting his knee. Let’s hope it’s not too serious and that he is back rotating again soon. The Juniors division had been sent out on the Sunday allowing them to compete in more suitable conditions. Unfortunately the wind did not favour them and was quite light and patchy making getting out through the falling southerly swell difficult. Hopefully Cronulla will be more kind and offer the kind of conditions they are ready for. Kai Bates managed a couple of nice waves and popped a small aerial to win the division. This event has been terrific thanks to the efforts of Jason Juretic, Tim Knowles and Tim Williams who ran a great competition, Jessica Holder who was in the background collating all the score sheets, Neilpryde and of course WindSurfnSnow. We hope to see you on the 10th/11th of December at Wanda for the 3rd event of the season! Previous O.M.G!! You should have been there! !